Dave has become well known throughout the marine industry for his persistent dedication to a lengthy list of boat and trade shows for the past 20 years. You can find him at all the major boat shows (and some smaller ones too) across the country. 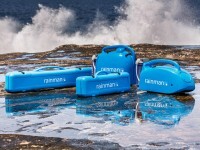 He’s up on all the latest, unique boating products and accessories found at the Cape Hatteras Marine booth, including the newest, award winning portable “Rainman” desalination systems. He’s been with “Rainman USA” since the first units landed here in the United States. In between all the boat shows, Dave can be found at our production facility in Costa Mesa, California making sure that all orders are being made to the exact specifications and quality we have become known for. If you ever have any questions about any of our unique products including Rainman watermakers and accessories, he’s the one to call!